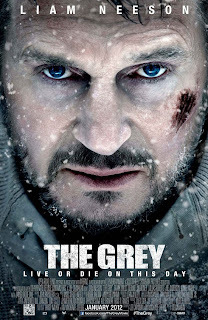 Those ill-omened words, spoken with characteristic gruff solemnity by Liam Neeson during a tense encounter with a hostile wolf pack, strike right to the anguished heart of director Joe Carnahan’s meaty, contemplative survival thriller The Grey. 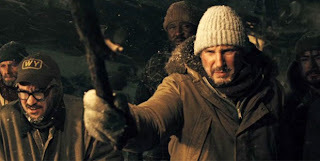 Deceptively marketed as a fist-pumping man vs. nature action flick on steroids, the film is, in all actuality, a grippingly bleak macho meditation on life, death, faith and redemption, dressed up in rugged genre picture attire. 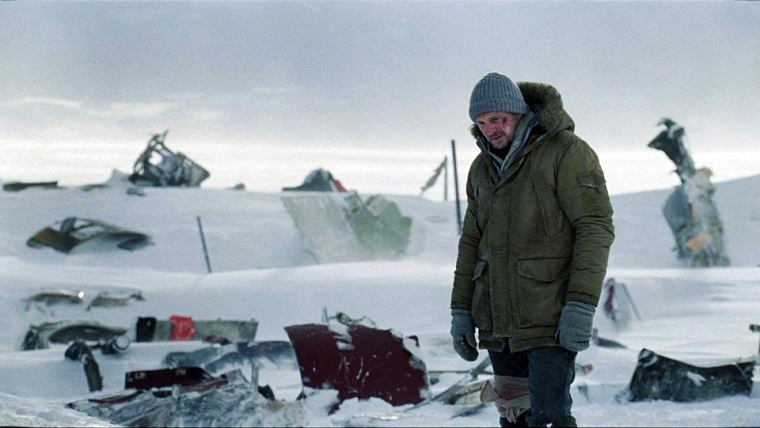 This movie doesn’t just entertain mightily; it cuts to the bone as harshly as a chilling blast from an oppressive Alaskan winter windstorm. 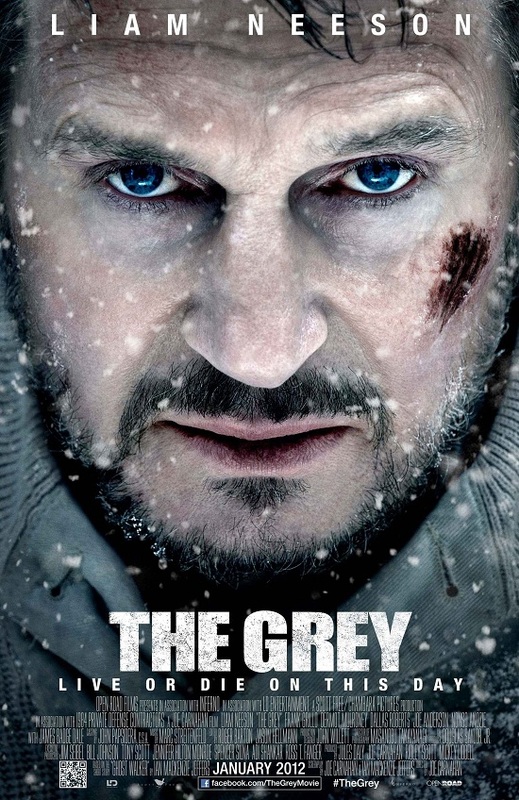 Leading the charge into the great, grim unknown is Neeson, as Ottway, a world-weary wolf sniper stationed at a remote Alaskan petroleum company outpost. Depressed and suicidal, finding comfort only in brief recollections of a beautiful brunette, he’s en route to liberation from his isolated refuge for “men unfit for mankind” when his passenger plane explosively crashes into the pitiless white wilderness. 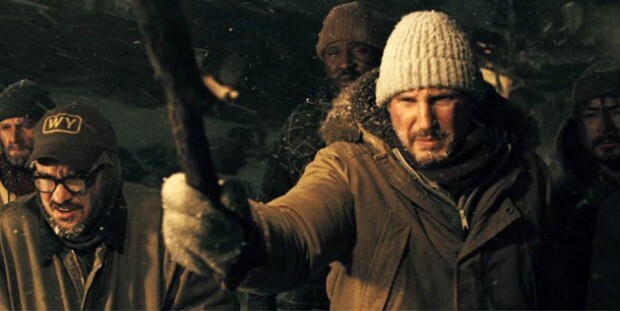 Stranded in the desolate, punishing environment with a small handful of fellow societal outcasts (including Frank Grillo, Dallas Roberts, Nonso Anozie and an almost unrecognizable Dermot Mulroney), Ottway determinedly rallies everyone to push forward on a perilous, uncertain journey in search of safety. Unfortunately for the group, though, their fragile hopes for a speedy rescue are violently dashed when they draw the unwanted attention of a ravenous pack of timberwolves, who are none too happy to have strangers encroaching on their fiercely protected territory. Unlike past outdoor survival pictures like Open Water or Frozen, The Grey isn’t overly interested in striving for gritty realism. Instead, Carnahan and screenwriting partner Ian Mackenzie Jeffers, who penned the short story, “Ghost Walker,” that inspired the film, have fashioned their red-blooded adventure yarn into a stirring tale of tired lost souls (“ex-cons, fugitives and drifters”) rediscovering their long-buried humanity and resolve to fight for their existence. These men have landed in an earthly purgatory, a primal, will-testing space between life and death – the very “Grey” of the title – where personal salvation is achieved only by embracing your fate and going out on your own terms. To this end, the movie’s wolf villains take on a more supernatural, thematically rich role. Although revealing themselves initially as GOTCHA! monsters, springing out of obscurity in dizzying displays of carnage-strewing horror (there’s a fantastic early moment wherein one four-legged aggressor overtakes an injured lollygagger on an dense, snowy plain, with the rest of the party helpless to sprint to his aid), they soon take on the more profound role of eerie carriers of the dead, savagely transporting their fatigued mortal prey into the next realm. Whether on-screen, as glowing eyes in the night or disconcerting howls on the soundtrack, or not, their terrifying ominous presence looms large over every single scene, keeping both the characters and audience in a constant state of intense agitation and dread. Joe Carnahan has been building to this film for a while now. Over the course of his short, uneven career, he’s shown an unmistakeable fascination with high-testosterone relationships under exceptional pressure. Stripping away most of the playfulness that coloured The A-Team and Smoking Aces, and pumping up the sober frankness that made 2002’s Narc such an audacious discovery, the helmer feels, for the first time, totally in control of his philosophical tough-guy vision. Carnahan isn’t exactly a subtle director – Ottway’s idyllic sun-drenched memories skirt dangerously close to caricature – but he knows exactly how to tap into cinema’s full visceral potential. Whether during the chaotic, you-are-there plane crash, or the utterly perfect poetic final moments, he feels engaged and in the moment, consistently excited to be taking the viewer on this unrelenting introspective quest. The helmer is well-teamed with the ever-reliable Neeson. The statuesque noble warrior star bears the haunted eyes of a man who has seen things – a crucial trait given the shadowy nature of his protagonist. At one point he talks a dying man through the final moments of his slow demise and there’s an unspoken sense this isn’t the first time Ottway has performed this difficult service. Among the actor’s finest gifts is his steadfast ability to sound utterly persuasive, no matter how crummy the dialogue or outlandish the situation (remember in The A-Team how he almost had us all convinced that tanks could indeed fly?!). He does exceedingly fine, nuanced work here, chewing purposely through The Grey’s crude four-letter-word-packed existential musings, and ringing every ounce of sad, impotent fury out of Ottway’s frustrated one-way conversation with the seemingly indifferent heavens above. Watching The Grey, I was often reminded of Henri-Georges Clouzot’s 1953 masterpiece The Wages of Fear. That movie, about four shady, damaged men in an impoverished South American town trucking ultra-combustible nitro-glycerine over miles of bumpy dirt road, rickety bridges and impenetrable jungle terrain, generated just as much unbearable suspense from the slowly developing interpersonal dynamics as the perilous cliffhanger setpieces. Carnahan’s film, with its stock supporting cast and relatively simple philosophies, doesn’t have quite as much on its mind as Clouzot’s remarkably complex epic – to be fair, few films do - but the picture does display a similar mastery of pitch-black irony and authentic working class honesty, as well as a delirious knack for constructing skillful sequences of escalating white-knuckle tension. It’s an undeniably bold work. Vigorous, awesome and surprisingly poignant, Joe Carnahan’s latest is a smart, rewarding left of centre approach to material that, in clumsier hands, could have resulted in routine “When Animals Attack” b-movie filler. Just like its ferocious furry antagonists, The Grey grabs hold like a vice, and mercilessly shakes you to your very core. And it doesn’t let go.